Oliver Queen defends Starling City in this all-new bookend from the hit CW show Arrow! 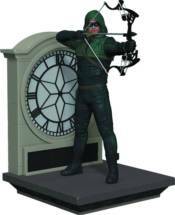 Standing on a clock tower base, the Arrow dons his mask and draws his new bow as seen in Season 2! This Arrow Bookend stands approximately 9' tall and is made of high quality polystone, making it a perfect display while holding up your favorite books, games, movies, and more!